"The much beloved synth siren Dana Jean Phoenix is back with her third, long-awaited full length album, 'Synth City'." Dana Jean then went on to perform with Melanie Durrant, Jully Black. Dana Jean toured internationally as the front woman for the Juno-Nominated band God Made me Funky, and has appeared at the Montreal Jazz Festival, Calgary Stampede, Ottawa Bluesfest, Toronto Beaches International Festival, NXNE (12), Canadian Music Week, New York M.E.A.N.Y Festival, and Cincinnati’s Midpoint Music Festival. She has appeared on Breakfast Television, Etalk, Canadian Idol, and Canada AM and has also shared the stage with the likes of Fergie, Mariah Carey, John Legend, Natasha Bedingfield, Kardinal Offishall, Joe, Divine Brown, and Suzanne Vega. After being featured on PerezHilton.com by the celeb blogger, for winning 2nd Place in the Perez Hilton 'Can You Sing Competition', Dana received a tweeted shout out from hip-hop megastar Nicki Minaj for her A Capella version of Minaj’s hit ‘Starships’. Dana has garnered over 1 Million views on YouTube. Her first full-length album ‘Drrty Shooz’, sophomore album, 'Le Mirage', and third album 'Synth City' have landed in the top 10 of the !earshot National Electronic Charts and her song 'Digital Life (RWR Remix)' was a semi-finalist in the 2017/2018 Canadian Songwriting Competition. The albums feature production from synthwave stalwarts such as: Timecop1983, Highway Superstar, Robots With Rayguns, The Northern Lights, Silent Gloves, Patrick Gill, S.T.R.S.G.N, Till Wild, London Lazers, and The Amazing Mr. S.
In 2018, Dana's first tour was in Europe with sold-out shows in Vienna, Warsaw, London, and Stockholm. Dana played her first US dates in Philadelphia, Rhode Island, and San Francisco. 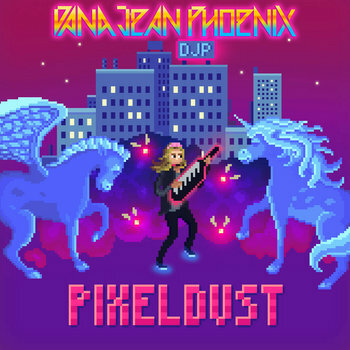 Dana's latest album, 'PixelDust' was released in 2018 and the PixelDust Deluxe Edition is available on Bandcamp now, and features production from Powernerd, Mecha Maiko, Till Wild, Straplocked, Favorit89, Satori In Bed, MikeGyver and Patrick Gill and remixes by FacexHugger, TOMMY '86, Gregorio Franco, The Rain Within, Oceanside85, and Dredd, and has been featured on Synthwave's leading sites and blogs: Vehlinggo and The Electricity Club. The fourth full-length Synthwave album by Dana Jean Phoenix created to take you to a time before life was complicated by all of the knowledge, stress, and hard won experience that you have now. Back when possibilities seemed endless because your world was colorfully enigmatic and very few doorways were shut to you. A time when you were in love, or just about to be. A time you can share today together, in the PixelDust.